AFC West foes open up Week 8 of the 2014 NFL season as the San Diego Chargers will square off with the Denver Broncos on “Thursday Night Football”. The season has reached the midway point and there shouldn’t be any reason to still be searching for pick em sheets. 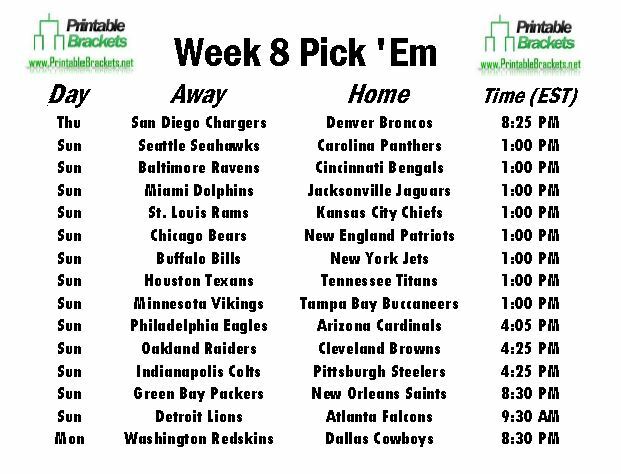 Get a printable NFL Pick Em Week 8 sheet and sheets for the rest of the season right here on PrintableBrackets.net. The Chargers and Broncos will renew their long-standing rivalry to kick off the NFL pick em Week 8 sheet. The teams met three times during the 2013 season. After collecting a 28-20 win in San Diego in Week 10, the Chargers captured a 27-20 victory on “Thursday Night Football” in Week 15. The Broncos would have the last laugh as they held on for a 24-17 win over the Chargers in the divisional round of the AFC playoffs. There are eight early Sunday games on the NFL pick em Week 8 sheet. In Carolina, Cam Newton and the Panthers will host Russell Wilson and the defending Super Bowl champion Seattle Seahawks. In New England, Tom Brady and the Patriots will tangle with the Chicago Bears. AFC North rivals will also collide as the Baltimore Ravens will clash with the Cincinnati Bengals. In late action on the NFL pick em Week 8 sheet, Andrew Luck and the Indianapolis Colts will face Ben Roethlisberger and the Steelers in Pittsburgh. Sunday’s action wraps up with the Green Bay Packers facing the New Orleans Saints on “Sunday Night Football”. The final game on the Week 8 schedule pits the Washington Redskins against the Dallas Cowboys on “Monday Night Football”. Only two teams will enjoy a bye in Week 8. The New York Giants and the San Francisco 49ers both have the week off.